Here we have 2 examples of high level graphics for our day. The Samaritan demo released by Epic Games last year was said to be pulled off using 3 GTX 580 GPU's on a PC. Next we have Killzone 3 for Playstation 3 with arguably the best graphics on a console yet. The Playstation 3's graphics card is based on a GTX 7800 at only 256MB and about 5 years old. The GTX 580 is one of the newer PC cards, and in the demo Epic was pushing 3 of them. So my question is, if PS3 can pull off graphics at Killzone 3 level while not looking that much worse than the Samaritan demo, why shouldn't we expect Project Cafe to do Samaritan level graphics with no problem? You have to remember that PC graphics cards need to take into consideration that there is an OS and background programs that need to be running at all times on a PC. With a console, all the power of the GPU can be focused on graphics which is why an R700 GPU based graphics card in the Cafe really will be a big leap in graphics performance. The Cafe will be miles ahead of the PS3 or Xbox 360, the only question is how many miles? (it probably won't matter) Nintendo so far is looking like they approached the tech side of things with a more competitive mind set this time around and will most likely future proof the system when the next consoles from Microsoft and Sony are released in a few years. This is a very exciting time, especially for game developers. To run the Samaritan Demo at 720p/30 fps the console running it would have to be at least 4.4x the power of the 360. This comes after the article IGN posted on the Xbox 720 being about 6x the power of the 360 and the Wii U being 5x. I know these numbers are getting ridiculous when it comes to comparing power, but it does look like good news for Wii U fans. What about Unreal Engine 4 on Wii U? From what has just been said/shown being taken into consideration, could the Wii U theoretically run Unreal Engine 4 in the future? People have been a little confused with the Samaritan demo thinking that it is actually UE4 when in fact it's still UE3. Epic Games has said that UE4 will be ready for launch on next gen systems probably in 2014 with a preview of it being shown this year, most likely at E3. With the next gen systems looking to be very close in power (as dev leaks have suggested minus what Sony does) the Wii U should be able to run the engine with little shortcomings since with EPIC being EPIC they will make the engine very scale-able to go along with looking amazing. I can also bring up the point again that the Samaritan Demo is a preview of what is to come in the not too distant future and likely Unreal Engine 4 will take a lot of those things from the demo and expand on it and optimize them for consoles. We know that it has become a console development world; EPIC knows this and will be making this engine work very well for consoles and not just high end PC's. When the next gen consoles launch, we will officially be at a point where it will no longer be a graphics / horsepower war. Graphics wise, all consoles will be "good enough". (The Wii somewhat established that and the next Nintendo console will continue to "disrupt" the competition). Think about it; after Project Cafe, Xbox720, and PS4 - how much better can it get? It will now be your choice of brand/loyalty. It will again come down to gameplay & controls/feedback. Amazing graphics will be a given. Business-wise, Nintendo has a huge advantage because of the timing of launch AND their machines are usually cost effective. I think the PC "port friendly" architecture is brilliant! As a PC gamer, I still enjoy my FPS with keyboard/mouse, but I have to say I simply cannot go back to the joypad after getting used to the Wii remote/motion+. I will be happily be an early adopter for the next Nintendo console. I agree that just about all the consoles are going to have some really nice looking games graphically, so how are they are going to make me want to buy them? Nintendo always seems to have a good answer to that question. also romours of xbox 720 E3 reveal. talk about limestael at the right time. Not much of a chance that Xbox 720 will be revealed at E3. That would be a waste of time on Microsoft's part seeing that it will not be ready realistically until 2013 at the earliest since dev kits are not really even finished yet for it. That was only a rumor posted by a desperate Xbox fanboy, don't read too much into it. what about unreal 4 WHO CARES epic will make up storys anyhows !!!!!! Great assessment. You can also find the flops for the power7 with 4 cores and 32megs of edrAm. 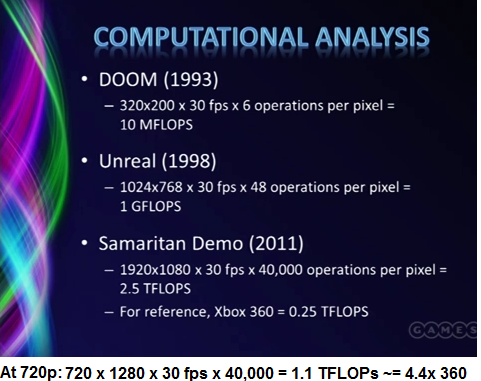 Then you can look up the actual gpu flops and see that that was possible already. Epic always uses brute force proof of concept first then they optimize the heck out of it. The big deal with the new ur engine is the use of light and transparency. This is part of the direct 11 shader tech. The way the wiiu is setup it might even have an edge over normal pc gpus when it comes to computing shaders. This could be big for tesselation. Only time will tell though. check out ati/amd cinema 2.0 thats what this set up could do!!!! dx11 is MS this is a nintendo console whats direct 11 got to do with it ????????? will it be a 4850 or a 4870 or even a 4890 the fact all 3 are the exact same GPU core seems totally out of there reach,these people actually think there the core !!!!!!! !IF YOUR CORE GUYS PLEASE EXPLAIN HOW YOU DIDN'T KNOW A CONSOLE DOESN'T USE A GRAPHICS CARD!!!!!!!!!!!!! !